Mother's Day is right around the corner! 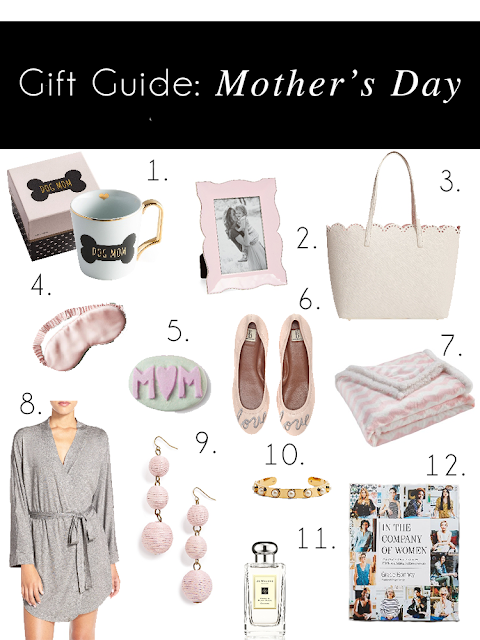 I spent a little time shopping at some of our local boutiques this past weekend, but could not settle on a single thing for any of the moms in my life. I always thought men were hard to shop for, but every year when Mother's Day comes around I find myself stumped on finding the perfect gifts. If you're still on the hunt for gifts too, I thought I would share some of my favorites that I've spotted online! 1. Dog Mom Mug: because some kids have paws! 2. Picture Frame With A Favorite Picture: my mom always loved to take pictures and I always loved finding pretty or unique frames for her to put them in! 3. Scalloped Tote: Can you believe this tote is under $50?! It's the perfect white bag for spring and has the most adorable pink lining. 4. Silk Sleep Mask: This is on my personal wish list as I love a good sleep mask. I travel with them, but I also use one at home since I sleep facing the window! 5. Lush Bath Bomb: Lush has become one of my favorite "treat yourself" stores this year. We have one at our mall that happens to be very conveniently located by the SoulCycle studio where I take classes and I justify each and every little bath bomb by telling myself that it is helping soothe my sore muscles! Whether you've got an active mom on your list or someone who just likes to relax these are the perfect treat! 6. Love Flats: Does it get any cuter than these little pink flats? I was browsing Nordstrom recently and saw that Ellen Degeneres now has a collection of shoes and accessories with them! 7. Plush Blanket: The limit does not exist when it comes to the number of comfy throws one can have. I love giving/receiving throw blankets because you know its something useful but luxurious at the same time! 9. Crispin Earrings: I have these and adore them. They're the perfect statement earring without being over the top and you can actually wear them all day because they are super lightweight! 10. Pearl Bracelet: Kate Spade, pearls and on sale? Yes, please! This bracelet would look great alone or stacked with others so no matter how much jewelry they wear you're good to go. 11. Jo Malone: Jo Malone is one of my personal favorite fragrance brands and my go-to daily perfume. They have such a wide variety of fragrances that can be layered to customize the perfect scent! 12. In The Company of Women: I've been eyeing this book for a while now. It's all about celebrating women around the world and their amazing accomplishments and I think it would make the perfect gift for any lady in your life! Whether you've got a picky lady on your hands or someone who would love literally anything you gave them I hope I gave you a little inspiration! Happy shopping!